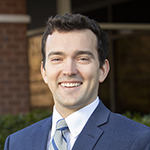 Jordan is a staff accountant at Meadows Urquhart Acree & Cook. He enjoys the challenge of entity taxation and helping clients organize their accounting systems. Jordan is interested in working with owners of family businesses and closely held companies, such as those in the real estate and construction industries. A recent graduate of Old Dominion University, Jordan enjoys spending time outdoors with friends and family and checking out the museums, restaurants and breweries that Richmond has to offer in his free time.